Contributed by Leslie Nutbrown, Jun 28, 2005 [lnutbrown@bell.net]. Total records = 125. From the town of Compton, take Hatley Road (Chemin Hatley) a couple of miles. 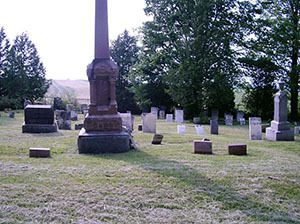 The cemetery is on the right as you go up a little hill and it is surrounded by trees amidst farmland. This small cemetery, maintained by the The Compton Historical Society, is known as the Carr Cemetery but other names appearing frequently are Hartwell Cemetery and Huntington Cemetery. The cemetery was mowed and trimmed on the day of our visit but there is really no place to park and it's location on a hill makes it difficult to park along the roadside. A farmer's field access drive is nearby and served us well. The earliest headstone dates from 1839 and the latest burial was in 1973. Susan Nutbrown and I visited this cemetery in June of 2005, and we have transcribed from all existing and legible tombstones or markers. Hadlock, Lydia M., d. 26 May 1866, age: 3y 5m, dau of John J. & Lydia H.
Heath, Almira F., d. 17 Apr 1839, age: 11m, dau of D. & C.
Huntington, Charley E., d. 29 Dec 1883, age: 2y 6m 24d, son of Thomas & E. B.
Huntington, George A., d. 1 Apr 1866, son of Thomas & E. B.
Huntington, Josiah G., d. 21 Feb 1855, son of J. G. & L.
Huntington, Lucinda S., d. 21 May 1842, age: 14m 9d, dau of Josiah & L.
Huntington, William, d. 30 May 1860, age: 7m, son of J. G. & L.
Kirkpatrick, Lizzie C., d. 15 May 1859, age: 2y 4m, dau of A. & C. H.
Kirkpatrick, Nelson A., d. 18 Oct 1865, son of A. & C. H.
Lord, Albert Leo, b. 25 Apr 1890, d. 3 Apr 1892, son of H. M. & Mary E.
Webster, Gracie A., d. 1882, age: 5y 8m 11d, dau of E. B. & S.